Veembroederhof 196 Amsterdam - Ramon Mossel Makelaardij o.g. 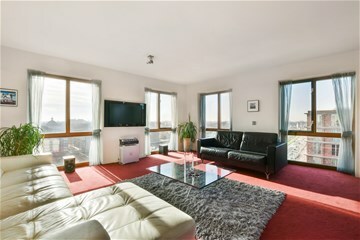 B.V.
Light, space, comfort and a stunning view over the entire city centre! 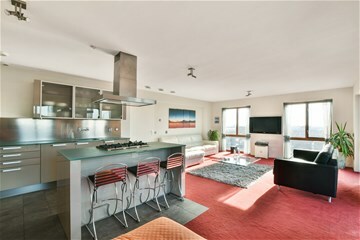 This two-bedroom penthouse offers 90 m2 of floor space and lift access. Situated on the 10th floor, south-facing floor-to-ceiling windows offer an impressive panoramic view of the city, as well as plenty of sunlight. 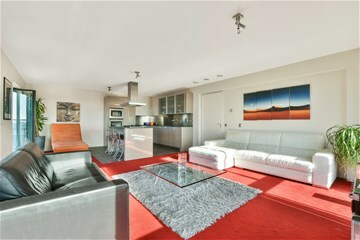 This attractive home is located on Piet Heinkade, on the edge of the city centre. 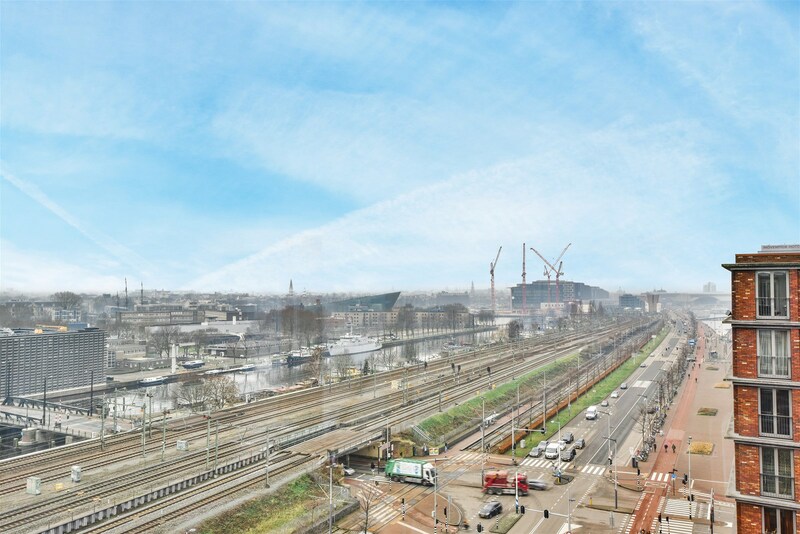 The surrounding neighbourhood is characterized by an attractive mix of contemporary architecture and authentic warehouse buildings, such as creative urban hubs Pakhuis Wilhelmina and Pakhuis de Zwijger. Shopping centre Brazilië is located nearby, offering a wide range of shops, supermarkets and specialist retailers, including a bakery, butcher’s and fishmonger’s. The area also boasts several lovely bars and restaurants, like Hanneke’s Boom, Scheepskameel and Happyhappyjoyjoy Oost. Several trams and buses stop just up the road, and Amsterdam Central Station is only a five-minute bike ride away. 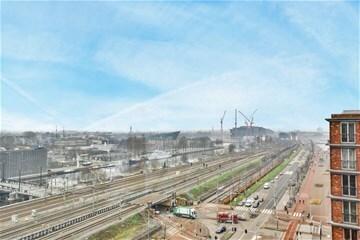 The home is also ideal for car owners: the A10 motorway is easily accessible via the Piet Hein and IJ Tunnels. There are many parkingplaces for rent or for sale in the neighbourhood. The modern, spacious foyer offers access to the lift, which takes you to the 10th floor. Entrance, foyer with access to all rooms. Lovely, bright living room with panoramic views over the city. The modern open kitchen is fitted with a Siematic kitchen island in high-gloss beige with a sleek glass worktop, with plenty of space left for a dining area. The kitchen also comes fully equipped with a 5-burner gas hob, oven, microwave, dishwasher, fridge and freezer (all Siemens). The living room offers access to the balcony, which is west facing, and the master bedroom is located to the front of the property, overlooking the city. The modern bathroom is fitted with a wash basin and spacious walk-in shower with glass panelling, and there is a separate toilet with hand basin. The apartment also features a spacious utility room with space for a washing machine and dryer. 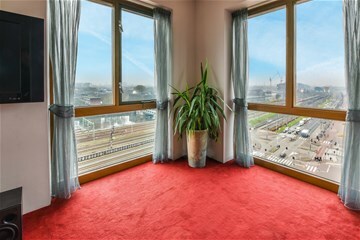 The large second bedroom looks out over the NEMO Science Museum and the National Maritime Museum. Finally, the home comes with its own storage unit in the basement. 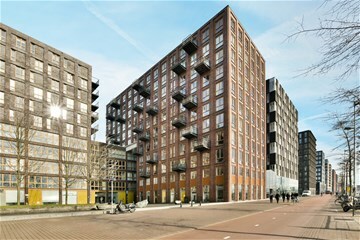 The property is situated on leasehold ground belonging to the Municipality of Amsterdam. The ground rent is €3307.68 per year and is tax deductible. The current lease runs until 31 January 2053. - Living area is 89.9 m2, plus 3.6 m2 of balcony (NEN 2580 measurement report available). - Underfloor heating system connected to district heating. 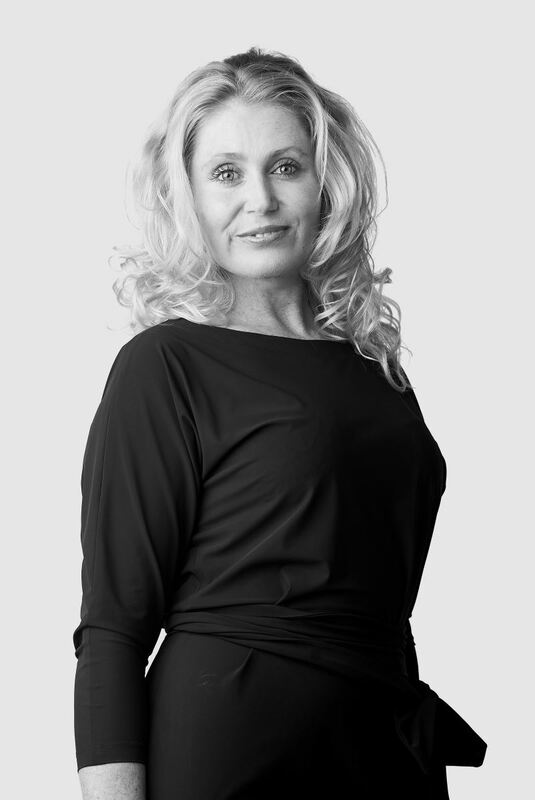 - The active home owners’ association is managed professionally by Munnik VvE Beheer. - Service fees are €162.17 per month. - The home owners’ association has a Multi-year Maintenance Plan.